Day #12; Toulon, France We got up early this morning and watched from our balcony as the Spirit pulled into the port of Toulon. This was, by far, the prettiest port area that we stopped at. Lots of yachts and naval vessels with wooded hills rising in the distance. 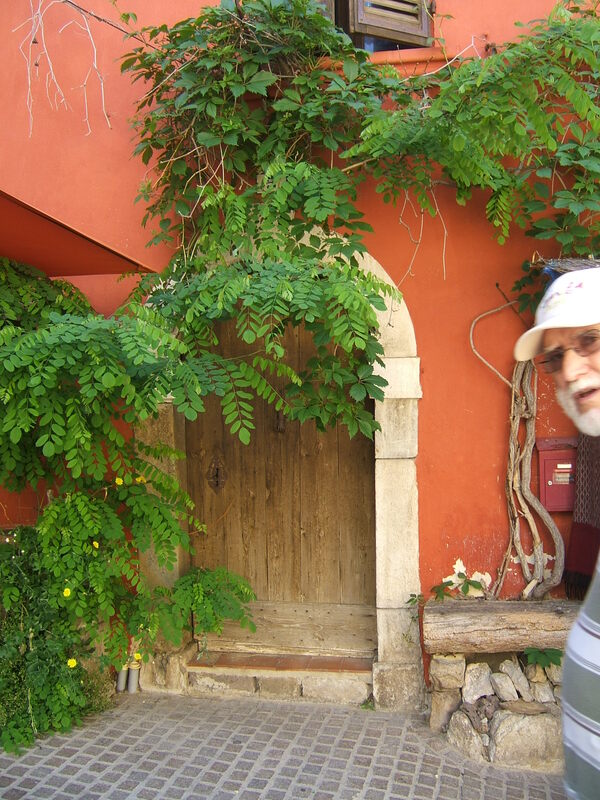 “Hill-Top Le Castellet & Seaside Bandol” Our meeting time for this morning’s tour was scheduled for 9:00 a.m. This turned out to be one of our most relaxing tour days, coming in a close second to Mykonos. Toulon was the tour stop that gave me the most trouble when I tried to choose a tour. Nothing on the list sounded all that exciting or appealing. I had almost decided to skip it altogether. After all the touring we’d been doing, a day of staying on board and lying around the ship all day might be nice! In the end I decided that tour time was too precious (and expensive) to waste. I bit the bullet and chose a tour. And then I changed my mind and chose a different one. And then I changed my mind again and chose a third… As I said, none of them sounded all that exciting so I was trying to choose between dull and boring and it was a tough decision. My choice of a half day tour, Le Castellet and Bandol, and another half day “Charming Sanary” was due entirely to the fact that these two towns are in the countryside. After all the city touring we’d been doing, it seemed that it was time to skip the city and hit some small towns. On a less than full bus, we first drove to Le Castellet, a medieval walled village atop a hill. The bus parked at the bottom of the village and we walked up the narrow streets to the top of the hill. It is not a long walk and not difficult. There are small narrow streets with shops all along the way and also a medieval church which was especially interesting as part of it has never been renovated so you get to see it in its original state. It is such a small village that you can wander without any worry of getting lost. All roads lead back to the bus. After our short walking tour with our guide, we had about an hour to wander before meeting at the bus. I could have spent much more time here browsing the unique and quiet little shops and wandering the streets looking at the trees and flowers. This walled town with the great views was the best part of our day. Next we drove through the countryside to Bandol, a new, man-made “seaside resort.” It consists of a casino and a single street lined with swanky shops and restaurants and a harbor filled with the boats of tourists. There was no real tour here. The guide simply left us outside the bus and took off to do some shopping of her own. vous English?” But that’s as far as we were going to get. Doc’s French is very rusty and mine is non-existent except for a French poem that I memorized in 9th grade French class which I can still recite despite no longer having any idea what it means. We weren’t going to be able to communicate with the French if the French refused to speak English. We came upon a street vendor who was cooking hot sandwiches and who did speak good English. Unfortunately, despite the delicious scent of sliced meat and onions wafting from his cart, he was finished with lunch and was just finishing up his “pre-orders” before packing things up for the day. He had no extras so we weren’t going to get a sandwich from him. We moved on. Spotting a Pizzeria, we hoped to grab a quick slice of pizza to take back to the bus with us as our time was growing short. The waiter informed us that they didn’t sell by the slice, only by the whole pie and they didn’t do any take-out orders. “I’m at a beachside resort and you don’t do take-out or anything smaller than a 20″ pizza pie?” Strange. My advice is, don’t plan to have lunch in Bandol. The stop wasn’t long enough to sit down and spend the time it would take to have a restaurant lunch. And there is nothing quick and easy to grab on the run. About all you can do here is shop–if you speak French or can find a shopkeeper willing to speak enough English to transact a sale you can understand AND if high-end, pricey shops are your thing. Better advice would be to skip Bandol altogether if you can get a tour to Le Castellet without it. There’s nothing special about Bandol. It’s a man-made town with little charm. After a drive back to the ship, we met in the parking lot for our afternoon tour. “Charming Sanary” is described by NCL as “a lovely 16th century port” with a Roman Tower dating from the 13th and 14th centuries which can be climbed for “a fantastic, panoramic view” and a 16th century church bell tower.” There also, supposedly, is a diving museum here. But we never knew any of this or saw any of these things while on our tour because our tour guide who got off the bus with us, pointed us toward a modern church that she thought we should look at, told us which restaurants were the best and then sent us on our way for the next two hours and she took off for her favorite coffee shop. 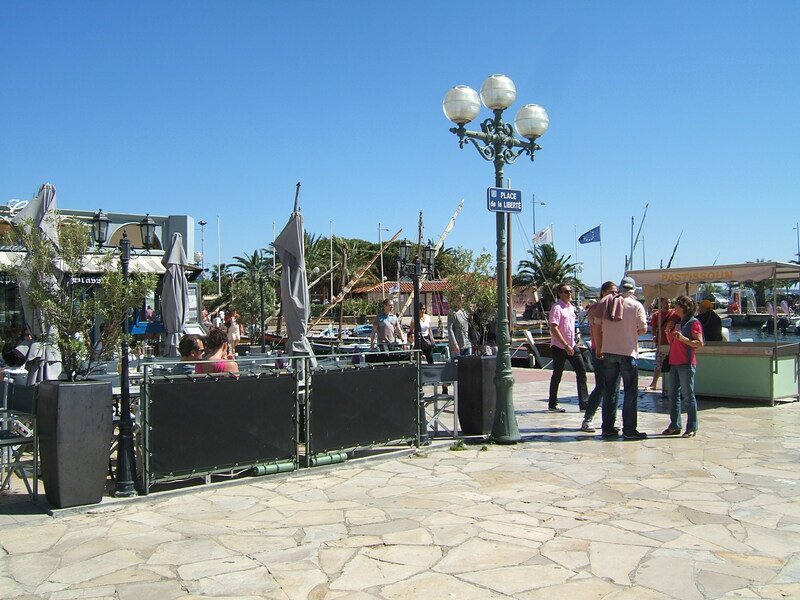 Sanary is an attractive but busy resort area filled with shops and restaurants. This “tour” turned out to be nothing but a shopping excursion. Did I mention that I hate to shop? I knew that shopping wasn’t what I had signed up for when I booked this tour so many weeks ago. Only after returning to the ship and pulling out my NCL descriptions did I realize what we had missed seeing. But no matter. Doc and I took a leisurely walk down along the waterfront, found a lovely restaurant overlooking the water, and had a nice seafood lunch. We also shared a gelatto afterwards on our way back to the bus, so the trip wasn’t a total waste. Bandol and Sanary however, are not tours I would sign up for again. But then again, I’m not sure I would have been happy with any of the tours that were offered. While most ports had so many great tours that it was hard to choose, in Toulon the cruiseline was hard pressed to come up with tours at all and every one of them was weak. Many of the passengers opted to not take a tour because of it and to go it on their own instead, but they soon found that there is nothing to do in the area of the port. Toulon is simply an odd stop for a cruise ship to make.